Arriving in the UK as a young girl from GuangZhou, I had carried with me vague senses of the Chinese idea of female beauty, the tall and slender figure with pale skin and long, silky black hair that falls like a waterfall. This was, in no way, me. I had been one of the tallest in my class in China, but was one of the shortest in my new school. I carried my puppy fat, my hair has always been more like crashing waves than a sleek waterfall. None the less, my pale red-haired roommate at boarding school seemed fascinated by my appearance. As I journeyed into adolescence, I began to appreciate my warmer skin tone – the product of a sub-tropical childhood, learning that in the West, it was appreciated as a sign of natural beauty and an adventurous life (Thank you Coco Chanel). On holidays and summer trips to China, I would eschew warnings from my relatives to stay out of the sun and shield myself from its rays with an umbrella at all times. Coming to terms with being a chubby and short teenager though, was much harder, as these were seen as more universal shortcomings. Even after I had long lost my baby fat, the process has left me with a lifelong dislike of seeing anyone berated for their weight or body shape. Beauty standards do evolve with time and fashion, anywhere in the world. Pale skin was highly prized by the Victorians, who were just beginning to come to terms with red hair, a feature that we now very much associate with beauty and passion. During the Tang Dynasty (7th-10th century), curvier, fuller bodies were considered beautiful, associated with wealth, and a certain softness. Just the fashionable shapes of eyebrows alone, have changed multiple times each century. With the pressure of modern media to align with a beauty ideal that could change with the next issue of RayLi, the plethora of on-the-fly selfie editing apps seems like a necessity, and far safer, in this game of constantly changing rules, than subjecting oneself to the thriving plastic surgery industry (China’s cosmetic surgery industry is now worth an estimated 45000 billion RMB). Themes of body modification and insane beauty treatments not only featuring in many Chinese soaps and internet novels, but even making it into China’s genre fiction, are a demonstration that living up to beauty standards has become a major preoccupation of contemporary society. Looking through recent Chinese media, I have noticed how these standards have changed over the last couple of decades. Where advertising and manufactured stars used to be presented as “Mung” (a sort of sprouting innocent cuteness), buxom babes are becoming the object of male desire, and girls are worrying about the size of their breasts, leading to all sorts of products leaping to market, from hormone creams and vitamin supplements, inflatable or magnetic cup-fillers. The desire for larger eyes, double lids and high-bridged noses however, seem to have remained, along with the much desired “unblemished” pale skin. In China, pale skin is still associated with wealth and affluence, the idea of not having to go out and work in the fields and expose one’s skin to the sun. Of course nowadays, you would be more likely to see naturally pale skin on an office worker trapped in a sunless cubicle, while the wealthy Chinese woman holidays in Madrid or Thailand. The concept however remains, and has sustained a whole industry of skin-whitening cosmetic products for at least four decades. I myself have struggled with being told, throughout my upbringing, that I don’t live up to these ideals. It wasn’t til much later in life that I came to be comfortable with my small nose, freckles and stronger face, and even to revel in my defined cheek bones and feline eyes shaped by those epichantic folds that the West considers so characteristically Chinese. It took me even longer to learn to compensate for and take advantage of my “yellow” complexion with clothes and makeup, if only because the make-up I found in the UK just was not designed for such a canvas. Now, we just need some Asian star to highlight the lack of choice, and launch their own range, ala Beyonce’s make-up artist, Sir John. Seriously. I have money waiting. Aside from a few Korean brands, which also seem to want me to undergo a 10-step, snail-based skincare program, wearing foundation still means altering the colour of my skin, either making it paler, or, by adding more red tones, making it browner. At least, with more East-Asian models like Li Jingwen being featured by retailers like Zara, I can imagine items working with my build, and my skin tone, so I can get a little inspiration before shopping, rather than tentatively over-purchasing, keeping the receipts clutched tightly, in case I later decide that the latest fashion makes me appear like a 12-year-old trying on her grandmother’s dresses. 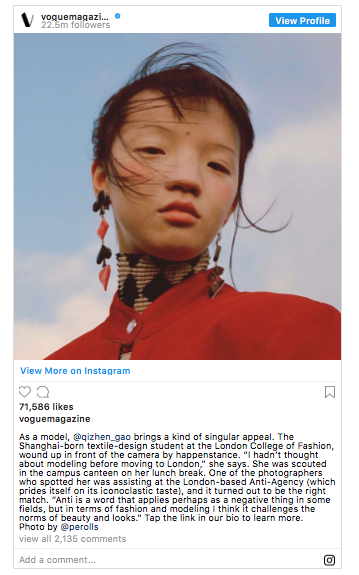 One thing that has helped me make this transition is living in the West, where, with the support of my very British partner’s family and friend from around the world, I get to understand outside perceptions of Chinese beauty. But for many young Chinese women, the pressure to look good and increase their chances in life come from a very competitive environment in which they live, from parents, from the barrage of images in the media of tall, slim and full-breasted celebrities and models with porcelain complexions and doll-like features. In the West, surgery tends to be the resort of older women who want to retain their youthful appearance, in China, it’s used by the younger generation as a tool to alter it. 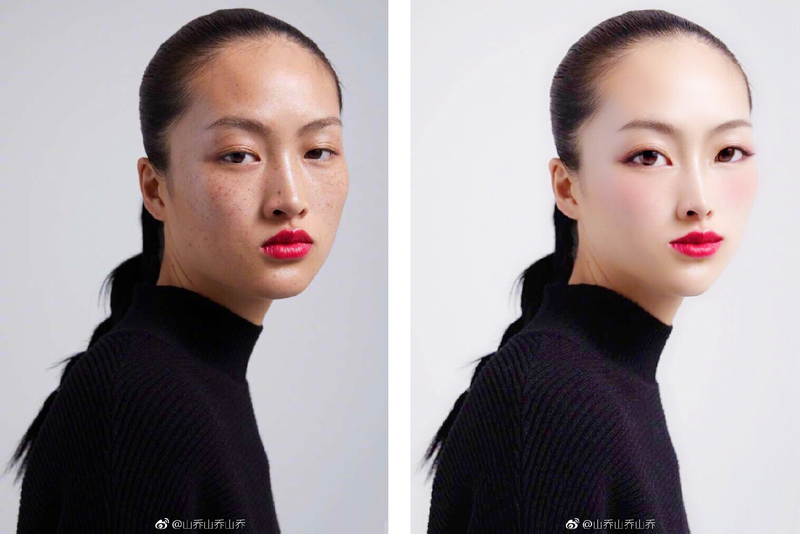 Whether it is the influence of Westernisation, K dramas or Japanese animation, most contemporary beauty standards in China promote features that are not naturally Chinese, or natural at all. It’s sad to see that ideals have strayed so far from the willowy, delicately-featured classical Chinese beauty, or even the slender-eyed calendar girls of the 1930s in their cheongsams. Perhaps with China’s increased economic confidence, and its already emerging cultural confidence, the Chinese will one day grow to love their skin the colour of burnished wheat, and cheek bones that can weather any storm. Perhaps even more importantly, both at home and around the globe, that the diversity of looks in China, the vastly varying looks between regions, ethnic groups, lifestyles, and generation, will on day all be admired as mei li and piao liang.